Happy happy Mother's Day to all you 12,000 wonderful Mums out there reading this post. Yes, that's you! Our work is an amazing legacy, and gift to the world. I hope you all enjoy your day with your families (and with them in your thoughts if you aren't together). 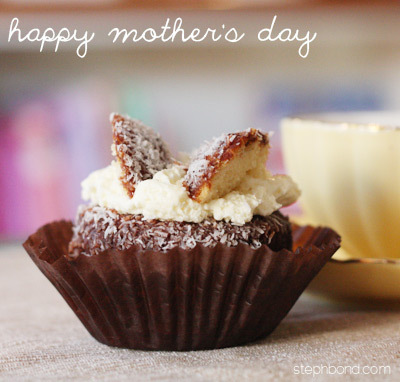 And to our own Mums too - thank you for inspiration, and endless love. Remember to take a break today, even if it's just a cup of tea and something sweet to remind you of the sweet things in your lives. This is a delicious lamington butterfly cupcake that my littlest and I made together. Just a few left now from the dozen, and we'll scoff them for morning tea. I don't know if I can back this as a trend ... unless you send me a batch to try out. Deal?